While the notice lauds Health Canada for cooperating with the US Federal Drug Administration and the European Medicine Agency to determine the cause of these continued impurities, it seems nine months of recalls have yielded little, if any, conclusion. Irbesartan is one of the myriad drugs Health Canada regulates, though it appears this cancer-causing poison slipped through the cracks. 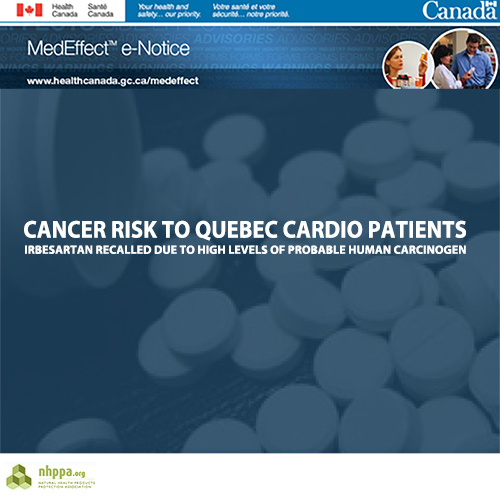 Quebec patients are advised to continue taking their prescribed ibersartan medication as short-term use is not associated with immediate risk. However, drugs like these tend to manage symptoms rather than heal conditions, so many Quebecois patients taking this medication will rely on it long-term. While this MedEffect Notice recommends alternative products, there is no mention of natural options that could effectively be part of the regimen to heal the patient rather than manage symptoms. A conversation, with informed natural health practitioners, about options should be made available. Pharmaceutical companies hold intellectual property rights that result in censorship issues for the natural health industry. In a growing number of instances manufacturers, retailers and practitioners cannot share truthful information about natural alternatives. Get the facts and stay educated by keeping up with NHPPA. Subscribe to NHPPA’s emails to ensure you do not miss an update. NHPPA’s website has volumes of content available to understand the deep concerns Canada’s natural health community has for the lives of fellow citizens.